Since 1998, a small one-man company in Missoula has launched hundreds of travelers into international beer scenes, taking them Abbey-hopping and Oktoberfest-ing so they can immerse themselves in the history of beer, pint by delicious pint. The business is BeerTrips.com, owned and operated by Mike Saxton in Missoula. BeerTrips organizes beer-related travel tours to the heart of international beer scenes. With trips to Belgium, France, Germany, Czech Republic, Italy, Brussels, Amsterdam, England and more, BeerTrips is one of the most unique and focused travel companies in business today, and it all starts right here in Missoula. On a given trip, 8-15 participants will visit 5-10 different breweries, eat at least one beer-themed dinner and experience a behind-the-scenes look at some of the oldest (and newest) beer producers in the world. The cost of each trip includes hotel lodging, local travel to all the sites, breakfast every day, roughly half of all lunches and dinners (with beer! ), focused beer tastings and excellent localguides. Trips last about 10 days and BeerTrips.com hosts about a dozen trips each year. Next up on the agenda is a trip to Italy, “which is traditionally associated with great wines, but Italian breweries are now making some fantastic beers,” says Saxton. This trip leaves on August 24 and only has one spot left. The company’s most popular trip by far is “The Great Beers of Belgium,” touring and tasting Lambic, Trappist, Saison and Flemmish Brown beers and breweries while also enjoying stunning art, architecture and history. This October trip is already sold out for 2011. 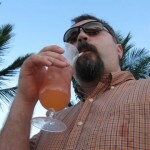 In its 13-year history, BeerTrips.com has garnered some attractive press. It was listed in the National Geographic book, The 100 Best Worldwide Vacations to Enrich Your Life, by Pam Gout. And it ranked #3 on MSNBC’s “10 Great Getaways for Guys” in 2007. The travel site has also been mentioned in The Washington Post, Los Angeles Times, USA Today, Examiner.com and in Frommer’s TravelGuides. To book a trip or learn more about the places you can go to enjoy a cold beer, check out http://www.BeerTrips.com. Tell us, if you could go anywhere to drink a beer, where would it be? And who would you share it with?